Try a new view of your life this year! 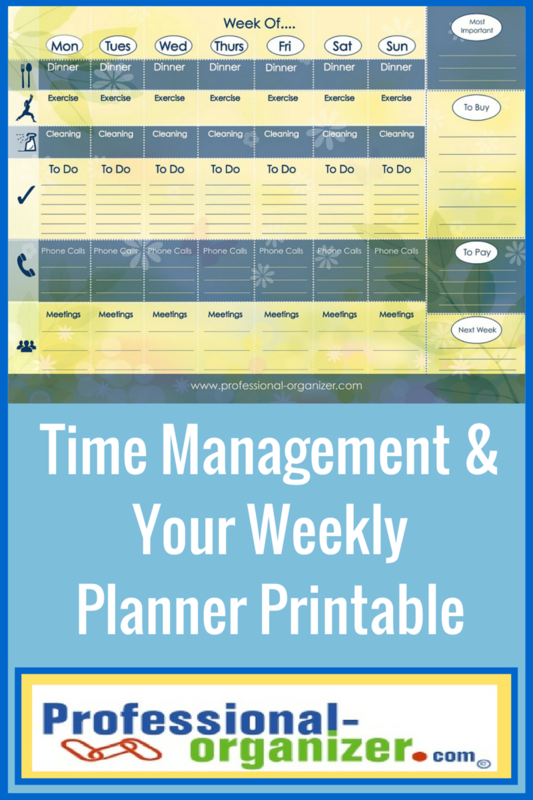 The weekly planner printable page will help you create order in your life. Set aside time before the week begins for your weekly planning time. Write everything down. It’s much easier to get tasks done when you are not trying to remember everything. Prioritize what is most important this week to keep on track. Lines for writing 6 To Do items each day. Jot down Phone Calls to make. Schedule and record Meetings and Meeting times throughout the week. Plan your dinner ideas, including main and side dishes. Track your cleaning schedule for the week. Make note of items To Buy and bills To Pay. Get ahead for next week with notes about upcoming events, tasks, and calls. Enjoy your weekly planner printable! Let me know how your week is shaping up and how things are going. Want more ideas on productivity? Check out my pinterest board! Taking time to plan each week is a great reminder. Thanks for sharing this Ellen! You are so right Megan! For me and my DH it makes our weeks run so much smoother! Really great weekly planner, Ellen! Thanks so much! !